DP-004, Pocket Recorder/Multitrack from Tascam in the RGX series. TASCAM has announced the DP-004 Digital Pocketstudio, a portable four-track digital recorder. Based on 30 years of Portastudio ® experience, the DP-004 retains the ease-of-use of cassette-based four-track recorders but updates it with CD-quality digital recording. 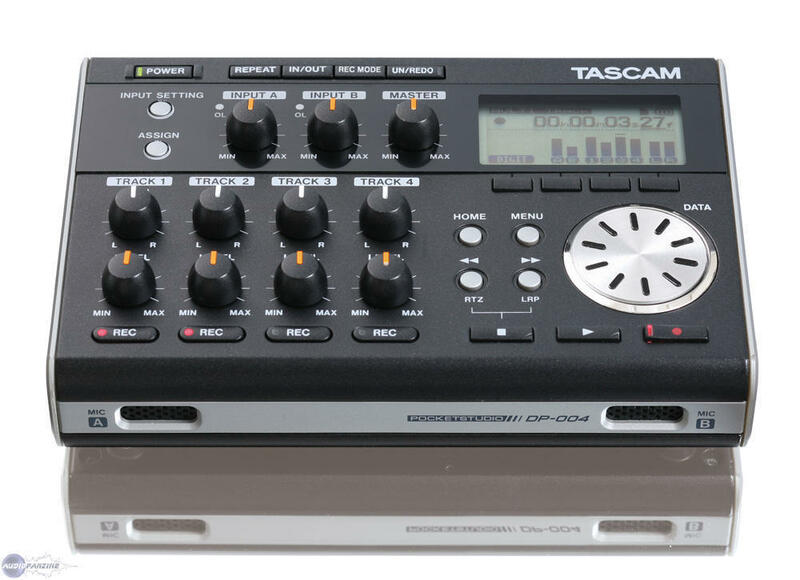 Tascam says that instead of confounding menus and windows, the recorder uses a set of dedicated knobs and buttons for easy operation. A pair of unbalanced 1/4" inputs accept mic or line signals, or musicians can employ the built-in stereo microphone. A stereo mixdown track is also included, and tracks or mixes can be transferred to a computer using USB 2.0. Smaller than a paperback book, the DP-004 is portable enough to bring anywhere. The DP-004 records to SD Card media, and a 1GB card is included. It features autopunch recording, track editing and an undo function. A metronome and tuner are built-in, and the Input A jack accepts a guitar-level signal for direct recording. The DP-004 is shipping in November 2008 with an estimated street price of $199. Presonus ships the new Studio Channel PreSonus announces the Studio Channel, a tube-based, Class A mic/instrument preamplifier with a VCA-based compressor and a three-band parametric equalizer. Thermionic Culture Fat Bustard Thermionic Culture releases Fat Bustard.